Once an important food source for many early Native Americans, some tribes relied on Yucca Root to cleanse and detoxify the body. It is still regarded today as a wonderful blood-cleansing tonic that helps to rid the kidney and liver of toxins. This root is an excellent source of healthful nutrients and the curative properties aid the eliminative organs (kidneys, liver, blood, and lymph), in removing poisons from the body. Yucca Root when taken internally, can help to treat the symptoms associated with arthritis, osteoarthritis, rheumatism, bursitis, and gout. It is believed the saponins in Yucca root extracts disrupt the production of the certain chemical that prevents new cartilage growth in the joints. Yucca extract also has anti-inflammatory properties that aid in reducing the swelling and pain associated with these conditions. High in fiber, Yucca Root is believed to be very beneficial for treating intestinal and digestive problems and can rid the body of the undigested toxic waste, that decomposes in the colon and produces foul-smelling gases. The saponins in Yucca Root have been shown to bind to harmful bile acids in the colon. The steroidal saponins in Yucca Root bind with cholesterol and prevent it from being absorbed into the bloodstream, thus lowering cholesterol levels. According to the Drug Digest, Yucca Root contains resveratrol, a natural antioxidant property that protects the body from damage caused by oxidation. Oxidation also produces free radicals that can lead to an increased potential for conditions such as heart disease. 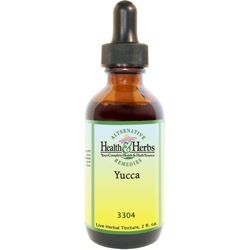 Yucca roots may help to stop the buildup of oxygen free radicals and prevent blood vessel damage. When used externally, Yucca Root has a long history of use as a soap, shampoo and hair tonic. It is soothing and non-irritating to the skin and has antifungal and antibacterial properties, some have used this herbal remedy to stop baldness and to make the hair shiny and clean without using chemicals. Ingredients: Yucca Root, Structured Water, 20% Alcohol. Non-Alcohol: Yucca Root, Structured Water, Vegetable Glycerin. Contraindications: Prolonged, uninterrupted use (longer than three months) of Yucca is not recommended, as long-term use may slow the absorption of fat-soluble vitamins (A/D/E/K). Check with your healthcare professional to see if supplements of these vitamins are needed if you are using Yucca over a period of time.